Emory has consistently been ranked among the top "Best Value" private universities by Kiplinger's since 2007. Kiplinger’s Personal Finance magazine has named Emory University a "Best Value" for 2012-13, ranking the university 15th overall in its annual Best Value survey of 100 top private universities that exemplify excellent academics while keeping costs to a minimum. Emory has consistently been ranked among the top "Best Value" private universities by Kiplinger's since 2007. Each year, Kiplinger’s assesses quality according to measurable standards, including the percentage of students who are admitted out of those who applied, the test scores of incoming freshmen, the ratio of students to faculty members, and the four- and five-year graduation rates. 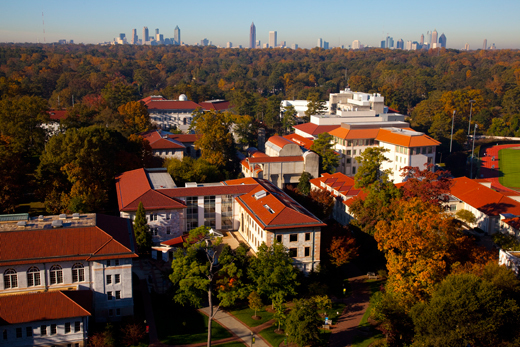 Emory meets 100-percent of the demonstrated financial need for all admitted traditional, domestic undergraduate students as determined by a thorough review of each family's financial circumstances. About 60 percent of undergraduate students at Emory receive financial aid, and Emory dedicates extensive financial resources to help families meet the cost of an Emory education. In 2011-12, more than $176 million in financial aid was awarded to undergraduate students, including both need-based and merit-based aid. Nearly 70 percent of the aid was provided directly by Emory.